In honor of Valentine's Day, a V-Day race review for you. On Saturday, as promised, I ran the Cupid's Chase 5k with my friend Kate. How was it? -The spread. Cupcakes, bottled water, canned pineapple juice, ginger ale, water, greek yogurt, pop chips, random socks, and - best of all - plastic bags in which to put all of your loot. -Race day registration. No line. Kate and I just walked up, filled out a form, handed over $20, and were in. -Making friends! I had planned to meet the infamous Mrs. Duffy at the finish, having already warned her that I'm completely awkward when meeting new people. Thanks to her eagle-eyes, we met at the start instead. Now, please go over to Katie's blog and read her account of the race and of meeting me. (Actually, please read her blog in general, but you can start with that if you don't read it already.) It makes me laugh because she said that she was awkward and that I had things to say. In reality, I kept thinking, "Why are you so awkward, Tracy? She's so nice, and you're just cold and you're babbling." Katie comes across in her blog as a smart-but-badass cool person. In real life she's a smart-and-also-warm-and-fun-but-badass cool person. -Race day packet pick-up. LONG lines. Should have registered race day, suckaz! -The weather. Is this their fault? Obviously not. But the course was so iced over at points that it was literally impossible to run. -The course. A double loop for a 5k - really? A narrow path that can only fit two abreast at points - really? And I get that they couldn't close the path to ordinary park traffic, but this caused some... congestion. -The other racers. Also not really the race's fault, but a charity 5k will bring out lots of casual runners who take long walk breaks or throw their hands in the air and stop cold when they see a puddle on the course. There is a chance I may have hip-checked another racer trying to pass me. I apologized to her but, between you and me? It was kind of on purpose and I wasn't all that sorry. -My finish time. Ugh. I knew I was out of shape, but I expected to be about a minute faster. That hurt. After the race, Kate and I did brunch with her adorable son and I rode a blue metal camel. 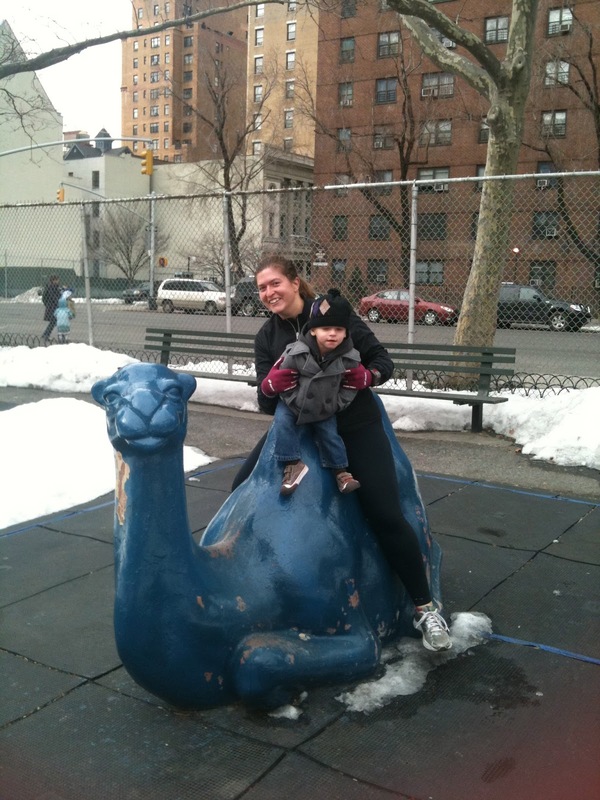 I just had to ride that camel. It's true. Did you lose weight while you were in Egypt (because they ran out of food or what?!) Well, Joe needs to feed you. Hee hee, *blush* you called me badass!